Checked my Fluid levels at midday and found one cell in one battery the level was just below top of the plates . The Batteries are Rolls s605 and only 8 months old and i find it very difficult to see what the lever actually is other than if its covers the plates , i have no idea how your supposed to tell when its 1/4 to 1/2 inch below the plastic piece inside , even using a light their is nothing to give any sense of depth of the level . The thing is one cell was definitely to low on fluid so i topped it up with approximately a cup full , maybe a little bit more of distilled water and the other 2 cells in the same bank with a little less . Now the SG on the cell that was to low is no even raising the float in the hydrometer and thats taking in enough fluid to fill the glass tube almost to the top approximately 3 inches above the float . Most of the day has been overcast so i only managed to get the voltage up to around 26.8 using the generator for about 3 hours and the SG on the low cell has not changed however the other two have gone from 1.14 to 1.15 , I check them every few days ad they are all around 1.23 before charging begins and 1.29 when it ends , today the remaining 9 cells in the 3 connected batteries are 1.215 -1.225 as i have been drawing off more today that has been coming in . The fluid in that particular cell was a bit cloudy immediately after i topped it up and i could see sediment floating on the surface , the fluid appears a bit clearer now with no or very little sediment on the surface , the other 2 cells remained clear . The voltage each day are all fairly close .001 - .002 , tonight all 4 batteries are within .001 so no change there however they are all connected so im wondering if thats giving a higher reading on the batteries thats low on SG . Have i stuffed the battery as everything i read indicates that allowing the fluid to fall below the top of the plates and the batteries will be a goner . .
Distilled water (SG 1.00) is much less dense than acid (SG 1.26ish), so when you add water, it tends to float on top of the acid until you can get things mixed up with bubbling at the end of absorb. If at all possible, I'd try to give the low battery a good charge on it's own. I find using the rubber tube on my hydrometer somewhat helpful in estimating level above the plates by touching the top of the plates with the bottom of the tube and looking at how far up the tube gets wet. That and moving a penlight around to see how far the relection is from the underside of the case. The Surrette s-605s have a lot of lead inside each cell, so, technically, there is less room for electrolyte, compared to other L-16s with less Capabity. SO, it is crucial to fill to the required level, or a bit above. If only just a few tenths of an inch of the plates were exposed, you are probably OK ... guessing. There is probably some capillary action, and gassing in charging should help to wet the upper plate area (perhaps). It is quite common for shed plate material to be quite fine, easily circulated during Gassing, and will usually fall out of solution, a few hours after Gassing ends. Agree with Estragon, use a small diameter flashlight (have always used a single AA battery powered LED light). Shine it directly into the vent well, move it around a bit. This should allow you to see the reflections of the vent tube in the electrolyte. Some Surrettes (at least the 5000 series), appear to have a bit of a protrusion at the bottom of the vent well, which causes a deformation (meniscus) in the electrolyte as the fill level touches it. This is very convenient, as it tells one where to stop adding Distilled Water. This function appears to be absent on the old S-530 bank, and may, or may not be present in your S-605s. It is very important to situate your Flooded batteries in such a place, and such a level, that it is easy to see into batteries vent wells, and easy to refill them as needed (OH, yea, this IS obvious). Keep at it, and you will develop a good technique. Also, if you are seeing SG readings on an accurate Hydrometer, above about 1.275, it can indicate that the electrolyte is LOW. Of course in S-605s there is not a ton of electrolyte, so this effect is probably fairly small. @Ako That would explain the high SG readings you described in a previous post, loss of water resulting in higher readings, which brings up the point of the controller rarely going into float. My old system which is a lightly used backup with a TS60, as you have, displays similar traits, the voltage remains high all day, batteries hissing away for hours consuming water, my intervention is to disconnect solar input every other day when sun is plentiful, this significantly reduces water consumption. Hopefully you caught it soon enough not to have caused significant damage, the added water will naturally dilute the electrolyte, taking a few days to stabilize, guess you'll be monitoring the levels more frequently, as @vic explains rising SG can be an indication of water loss. Top them up when fully charged, the warm electrolyte will contract, the dark cells are hard to gauge when filing on those I fill until it touches the fill neck tube when warm, when the temperature drops 10°C , it has contracted to below the tube. Really like the semi transparent batteries, where the levels are easier to monitor. such that tip of the hydrometer extends 1/4" below the filler hole - now it works like an oil dipstick. If the electrolyte is below the tip of hydrometer then the electrolyte is too low - add water. It is very easy to see of the tip of the hydrometer goes under the surface of the electrolyte or not. You may now have a cup of distilled water essentially "floating" on top of the denser electrolyte. You need to "mix it up". You can use your Hydrometer to pull-in and release the electrolyte several times - until SG is normal. to rise up from the bottom and mix with the new cup of distilled water on top. Low electrolyte = exposed plates will sulfate immediately! Mix the electrolyte and then run an EQ to get the sulfate off of the previously exposed plates. Do not let the sulfate crystals harder, otherwise that will be permanently lost capacity. Batteries sit too long between charges. As little as 24 hours in hot weather and several days in cooler weather. Battery is stored without some type of energy input. Undercharging of a battery to only 90% of capacity will allow sulfation of the battery using the 10% of battery chemistry not reactivated by not completing the charging cycle. Low electrolyte level - battery plates exposed to air will immediately sulfate. Incorrect charging levels and settings. Rolls recommends a 3-phase charge cycle (Bulk, Absorption & Float). See State of Charge & charging information. The longer a battery sits and is not re-charged the more damaging sulfation build up there may be on the plates. Studies have noted that nearly half of the L-16 battery capacity can be lost if the regulation voltage is too low and the time between finish-charges is too long. In normal use, battery plates are getting sulfated all the time. When a battery is being discharged the lead active material on the plates will react with the sulfate from the electrolyte forming a lead sulfate on the plates. When there is no lead active material and or sulfate from the electrolyte remaining the battery then is completely discharged. After a battery reaches this state, it must be recharged. During recharge, the lead sulfate is reconverted into lead active material and the sulfate returned to the electrolyte. When the sulfate is removed from the electrolyte the specific gravity is reduced and the reverse takes place when the sulfate is returned to the electrolyte. This is why the state of charge can be determined with the use of a hydrometer. If a battery is left standing in a discharged condition the lead sulfate will become hard and have a high electrical resistance. This is what is normally called a sulfated battery. The lead sulfate may become so hard that normal recharging will not break it down. Most charging sources, engine alternators and battery chargers, are voltage regulated. Their charging current is controlled by the battery's state of charge. During charging, battery voltage rises until it meets the charger's regulated voltage, lowering the current output along the way. When hard sulfate is present, the battery shows a false voltage, higher than it's true voltage, fooling the voltage regulator into thinking that the battery is fully charged. This causes the charger to prematurely lower it's current output, leaving the battery discharged. 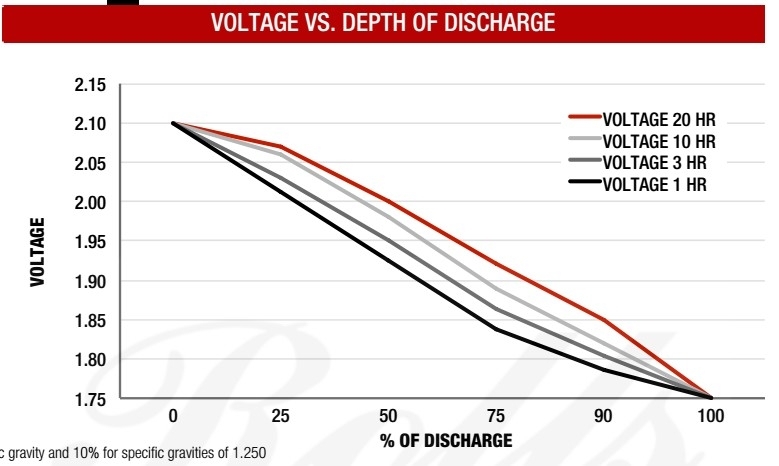 Charging at a higher than normal voltage and low current may be necessary to break down the hardened sulfate. Hardened sulfate also forms in a battery that is constantly being cycled in the middle of its capacity range (somewhere between 80% charged and 80% discharged), and is never recharged to 100%. Over time, a portion of the plate's active materials turns into hard sulfate. If the battery is continually cycled in this manner, it will lose more and more of its capacity until it no longer has enough capacity to perform the task for which it was intended. An equalizing charge, applied routinely every three to four weeks, should prevent the sulfate from hardening. In both cases, the fact that the battery "won't take a charge" is a result of improper charging procedures which allowed the sulfate to harden. In most instances, it is possible to salvage a battery with hardened sulfate. The battery should be charged from an outside source at 2.6 to 2.7 - volts per cell and a low current rate (approximately 5 Amps for small batteries and 10-Amps for larger ones) until the specific gravity of the electrolyte starts to rise. (This indicates that the sulfate is breaking down.) Be careful not to let the internal temperature of the battery rise above 125° F. If it does, turn the charger off and let the battery cool. Then, continue charging until each cell in the battery is brought up to full charge (nominal 1.265 specific gravity or higher).This time needed to complete this recharge depends on how long the battery has been discharged and how hard the sulfate has become. The next time your batteries don't seem to be taking or holding a charge, check the specific gravity with a hydrometer. If all cells are low even after a long time on charge, chances are you've got some hardened sulfate that has accumulated on the plates. By following the instructions outlined above, the problem may be corrected. Is there sulfate in the air to deposit on the plates? Must mean whatever sulfate is already on the plate will harden faster in air than when submerged? I don't know... Certainly there is oxygen in the electrolyte (especially when the battery is gassing). A number of lead basic sulfates are known: PbSO4·PbO; PbSO4·2PbO; PbSO4·3PbO; PbSO4·4PbO. They are used in manufacturing of active paste for lead acid batteries. A related mineral is leadhillite, 2PbCO3·PbSO4·Pb(OH)2. At high concentration of sulfuric acid (>80%), lead hydrogensulfate, Pb(HSO4)2, forms. -Bill "above my pay grade" B. Even with bubbling O2 in the electrolyte, the charging current prevents lead sulfate from forming. The "charging current" changes the lead sulfate molecules into sulfuric acid. there is no charging current (electric field) to stop the sulfation process. Thank you all for the encouraging and informative information . Yesterday i topped up the remaining 9 cells which although were covering the plates were all low on fluid . The SG readings on al cells were not enough to raise the float in the hydrometer although the 9 were all reading around 1.21 before topping up so i have now seen the effect for myself so i dont feel as worried about the odd cell that had exposed the plates although im sure the plates in that particular cell were not far above the fluid leveel and the level was only a very small part of them were exposed . Weather here has been dark and overcast sinse i noticed the low cell and looks to be for the next 48 hours so im having to use the generator which after 4 hours of charging can only raise the voltages of the bank to around 26.8v , no idea how many amps the charger is giving but i have noticed the voltage coming out of it is only around .02 above the bank but rises as the bank voltage does but only ever showing an output slightly above the banks voltage . I took the suggestion of usinh a penlight and it was better however still difficult to see how much distilled water to add as there is no point of reference inside the batteries however as this will be a problem for some time and i have already come close to doing some costly damage through not having sufficient fluid i am going to try something later that i hope might make things easier . I am going to use the clear outer biro tube and mark on it the Min/Max levels and by lowering it into the fluid and placing my thumb over the top and lifting it out i hope i will have an accurate indication to judge how much fluid to add , providing the fluid in the tube remains as it was when sitting on top of the plates , Would it be safe to try this or could the Biro tube do any damage by sitting directly on the top of the plates and mat ? . If that dosnt work then i had another idea . which would be to place a ruler or something plastic in the filing/vent hole with a mark on it to provide something to compare the level to by sight . makes life a little easier. Not seen them before but im going t find one locally and try it , looks like a solution and would make topping up much easier and quicker . Sorry to do this but have just encountered something strange on my TS60 now , seems to be just one of those weeks . The weather is dark and wet but my system did go from night to Bulk although about 45 minutes later than normal but after 40 minutes in Bulk it went into NIGHT then after an hour and a half i got a fault showing , R-Y-G , couldn't find anything obvious but i unplugged the solar array then the power to the TS60 and then reconnected the TS60 then the aray and correct light on for the voltage but still in NIGHT mode . Voltage coming off the Aray is shown as above the Batteries voltage but no current showing at all in fact the only current i have seen today was around 1/4 of an Amp for 10 minutes earlier when in BULK . The TS60 and the batteries have been in around 7 months and in all that time the weather has been bright and sunny with cloudless sky's with only the occasional cloudy days for a few hours but those times were after the batteries were near changing from Bulk to Asorption do the voltages were up close to 29v so i have no previous knowledge to compare everything to but surely something has to be wrong to be in Night mode when the aray voltage is either just under or just over Bank sense wire voltage . Is there anything i can do or try or information that will help to get to the bottom of the anomaly and if possible correct it . SG readings still either not raising the float or around 1.16 as theres not been the opportunity to give it a good enough charge to get then bubbling . R-Y-G sequencing is either a dip switch fault or a self test, assuming no dip switches were changed its probably a self test, if the array voltage cannot exceed the battery voltage, it will go to night, then do a self test, to establish itself. If the cloudy weather is preventing the array from supplying current over 29V that could well be the issue. What sort of charger, when using the generator do you have? Haven't changed any DIP switches or in fact done anything . 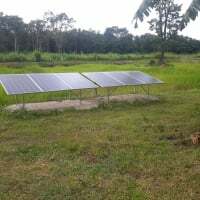 The charger is just a simple transformer someone gave me years ago after they had electricity supplied to their property and sold off their solar system . Its not even in a case , just a transformer with 3 different voltage take offs from different parts of the copper winding . It was fitted originally by an old solar guy who i knew and he does know his stuff and used to fit these to every instillation he fitted , probably about 20 years old at least . If voltage readings are taken directly off it they are always just above the bank voltage by about .2v and raises as the banks voltage rises but no idea how many current it produces , think possibly about 20 amps . I am not questioning as your far more knowledgeable that me but i am puzzled by the comment about the array voltage being below battery voltage going into NIGHT mode as looking at my Loggers closely the sense voltage is lower for a considerable time before changing to NIGHT and a considerable time prior to changing to BULK . I feel a bit better now as it showing it went into BULK again but with am Array voltage .06 below batteries sense and zero current coming in , 25 minutes later i have .03 amps increasing to .25 amps but still the Array remains lower then the sense wire . RTS is working ( 24c ) as is the sense wire and the voltage indication lights on the TS60 are functioning accurately . Generator ran out of fuel 15 minutes ago so the voltage is dropping slowly as i would expect it to and so is the Array voltage it appears to be tracking the battery voltage but by around .10 beneath it , odd it was higher with the generator running although the -.10 was maintained . Oddly enough today I had to use the generator for the first time to supplement the solar, charge current was 57A, the voltage went straight up to 29.3V temperature compensated, into the absorption stage, it held that for 1 hour before reducing to 28.6v at 15A, solar finished the absorption. Whilst the charger was on, the controller could not match the voltage of the charger, indicating 0A for its output. Perhaps your chargers voltage exceed the arrays potential so it got confused, a speculation. My thoughts are perhaps a larger charger than 20A would be benificial, to extract more energy from the generator, a larger charge capacity would shorten the run time, but that depends on the generator capacity, just some ideas. I do know the Max from the charger is 29v as last year i charges a bank , took it from 24v to 29v which i think is its Max as it wont take the bank higher but the array MAX is greater than that , its a 24v array so i think will be around 35v , just guesswork there but im confident it is much higher then 29 as the voltage set point into Asorb is 29.76 and i have equalized several times without problem up to 31.8 just from the Array . A larger charger would be ideal but i couldn't realy justify the cost as this weeks weather is extremely rare possible once a year and i think my generator is only 3kw so i dont know if it would run a larger charger . Although still cloudy it is lighter then earlier and im starting to show a current coming in which has risen to 17 amps now and the voltage shown on the Array for the TS60 is just slightly above the Battery voltage so moving in the right direction . Wonder if having no SG showing is responsible for all the silly readings i have been getting today . The low SG would indicate a high state of discharge, the current demand required to replenish the batteries would therefore be high, which in turn would drag the voltage down, if the array couldn't match the battery voltage for a short duration, the controller may go to night mode momentarily, do a self check and during that time the voltage may have dropped below the array value hence the anomaly. This is purely speculative but sitting on the fine edge of array output versus battery voltage could very well have been responsible. Hopefully you get some sun today, judging from the 17A, everything is working. Was interesting to see the effect the bubbling increased the SG , after just a few hours . Back to sunny clear skys today ,SG risen again and the difference between cells has gone from .45 down to .30 so going in the right direction ,, yesterday i had between 1.185 and 1.23 today i have between 1.24 and 1.27 , only problem is the voltage after charging has ended is still much to high , even after settling i have 25.35 with the RTS showing 31c which means the actual voltage is even higher so that aspect of these batteries hasn't changed , hoping now that after the additional water added the other day the SG reading will come down to the levels they should be 1.27 . Checked the voltages shown on the TS60 matched the voltage meters and Changed the TS60 to another new one i had to eliminate that as a possibility . That voltage is not an indication of a problem, that is quite normal and not too high, it would indicate the battery is close to being fully charged especially if that voltage is maintained for 4 hours of no charging and no loads. Additionally the voltage is the voltage, being at 31°C doesn't mean it is higher than indicated. On my 24v system i have been making corrections to the voltages shown after settling by adding .06 for every 1c so a voltage of 25.35 i added .36 ( .06x6=.36 ) which i have always assumed to be the only way to find the true voltage , the addition of the .36 actually would indicate my batteries were 25.71 . I realize that during charging they become much higher but assumed that would settle out to 25.2 after resting or with a very small current being drawn . My 4 x 6v Rolls S605s as i understand it should only have a fully charged voltage of 25.2 ( 2.1v per cell ) which is why i felt the voltages i am seeing are to high , the set points for all stages of charge are as Rolls stated in an email . I dont seem to be able to reduce the settled voltage and the thought that i could be overcharging them is my concern now , had hoped that with the addition of water it would sort the issue , it has as far as i can tell for the SG but even though that has not yet reached the 1.27 the voltages have exceeded the 25.2 . Somehow you have become confused with compensated voltage, the compensation is to reduce or increase the charging voltage when the temperature is above or below 25°C. A remote temperature sensor will automatically correct the charge voltage, a default value of 0.06V for every degree on a 24V system, so for example at 25°C your bulk/pwm is set for 28.8V, when the temperature rises to 30°C the voltage would be reduced to ( 5×0.06=0.30) so the voltage would be 28.5V charging. Inversely if there temperature were to drop to 20°C, the voltage charging would be increased to 29.1V. In the absence of a RTS these values can be programmed if the temperatures are known to be stable, but the dynamic changes afforded buy a RTS are far better and can account for temperature rise due to charging, which may be higher than ambient, can't remember if you have a RTS or not, if not its a good addition to a system. The standing voltage after charging is just that, you wouldn't add or subtract, if it reads 25.2V that's what it is. You need to be close to 30V to get that battery charged. Just do it, or the battery is going to sulfate. Charging voltage is several volts higher than resting voltage, you have to pump power into the battery. I would like to thank everyone for their advice which is proving to be invaluable and in some cases corrected long held misunderstandings . My next couple of questions might seem trivial and common sense but i would still like to be sure . The attachment is taken from the Rolls manual , it shows a tube descending just over an inch down into the cell as a solid tube , that might just be artistic licence however on my S605s the tube is not solid , i have 3 projections , 2 of which are about 1/4 inch wide , the 3rd about an inch wide , the correct level is shown to be 1/4 to 1/2 below the bottom of that projection . If the projection were to have been the fluid level then it would make seeing the lever much easier , as its not shown to be then what purpose do they serve and why do you think Rolls would not simply show in their diagram a split to show the projections as they actually are unless possible some of their batteries do have a solid tube projection . The second is using voltage as an indication of DOD just before charging begins as i dont always have time in the morning to take SG readings . The Rolls graph shows 4 curves for different C rates , which would be applicable as the batteries would have been resting for several hours and im not needing to know what could be drawn off them in a particular time which i have always understood the C number to represent . I think i arrived at a voltage compensated by taking the voltage which for instance if it was 25.35 and the temperature was 10c higher than 25c the charts show to add .60 so i understood that t mean that if the temperature suddenly dropped with nothing going in or out of the batteries then the voltage reading would rise and show a reading of 25.95 ( 25.35 + .6 = 25.95 ) . As i have always been concerned about the unusually high SG i was getting 1.29- 1.30 as well as the voltage of 25.35 - 25.4 knowing these batteries to be fully charged at 25.2 i read some articles on overcharged batteries and it gave swelling as an indication . Have looked at mine with a straight edge and they do in fact show a 1/10 of an inch bulge in the center of the cases . I know for sure that the highest the batteries have ever been taken to is 31.8v from the TS60 log and that was for a few seconds only and my inverts shut down , they shut down around a minute after the voltage exceeds 31.6 , so i had to adjust the equalization for the RTS controlled charge voltage to 31.5 , i also know from the close motoring i have done over the 8 months sines i bought them , the equalization was done for 2.5 hours as instructed by Rolls . The only variable i have no control over is Absorption as the TS60 uses its own computation of needing a cumulative hour at 30% before stopping Absorption so is it possible thats where the problem lays , to much current being forced in . I am tempted to reduce the absorption time to 30% or less for 30 minutes or 50% for the hour however i dont feel im experienced enough to feel confident of either . - Resting voltage shouldn't be adjusted for temperature in establishing an approximate state of charge. A fully charged lead acid battery with no loads or charging sources for several hours will be ~12.8v at 70°f or at 0°f. You don't compensate because with no charging or discharging, there is no chemical reaction to speak of going on (a tiny bit for self-discharge, but not enough to matter for this purpose). - What does get adjusted is the voltage when charging. If the chemical reaction is going on with a warm battery, it will happen faster, so a lower voltage is used. If cold, the reaction happens slower, so a higher voltage is needed. Overcharging isn't normally caused by a too-long absorb. It's caused by charging at too high a voltage relative to the temperature of the battery. An EQ is in fact a controlled overcharge. AFAIK, bulging would be caused by overheating (or freezing a discharged battery), which you should be watching for when EQing. Personally, I wouldn't get too worked up about 1/10th of an inch in a tall battery. A normal absorb cycle should take something like 2-3 hours or so at proper temp compensated voltage. @Ako said The attachment is taken from the Rolls manual , it shows a tube descending just over an inch down into the cell as a solid tube , that might just be artistic licence however on my S605s the tube is not solid , i have 3 projections , 2 of which are about 1/4 inch wide , the 3rd about an inch wide , the correct level is shown to be 1/4 to 1/2 below the bottom of that projection . If the projection were to have been the fluid level then it would make seeing the lever much easier , as its not shown to be then what purpose do they serve and why do you think Rolls would not simply show in their diagram a split to show the projections as they actually are unless possible some of their batteries do have a solid tube projection . The purpose of the slots in the tube are to allow gas to escape should the level reach the tube, if the tube were solid, the gas would force the electrolyte up the tube, resulting in spillage. Bare in mind the surface area of the electrolyte as a whole is much greater than that of the tube itself, hense the need for relief ports. Bought a battery filler bottle with a valve similar to the one you gave the link to , its actually a 2 ltr one and shown lower down the page as the one shows is not available here . Unfortunately my Rolls Batteries have a Min/max filling level 3.5 to 4cm below the top of the batteries and the automatic filer works well except that it is designed to fill up ti 2.5 cm so i overfilled them all and had to remove the surpluses 1.5cm which took longer than filling them the traditional way with a funnel . Could not see what causes the filler to stop pouring when liquid reaches it and tried extending it a short piece of rubber pipe but that didnt work , also consider removing 1cm from the plastic stop that sits on top of the battery and either cutting a step or tapering it so that it sits down inside the filling hole but i dont think theres enough mass of plastic to stand the loss of the amount that would need to be removed . I cant fnd a schematic drawing to study it closer and explore if theres any other way of doing it . Wrote to supplier on the chance they might have a solution , not had a response so i think they are just distributors of a lot of products . If you know of a product that has either a longer nozzle or an adjustable nozzle that can be cut off to supply the correct level then i would be most interested . I did consider leaving the level above the maximum as the batteries were fully charged and about as hot as there likely to get at anytime in the future but i am not sure what effect this would have long term if i continued with the practice . What you removed from the batteries is acid mix, and should be returned to them at the next filling. If you "tossed" it out, you have thrown away some capacity by reducing the acid inside the cells.